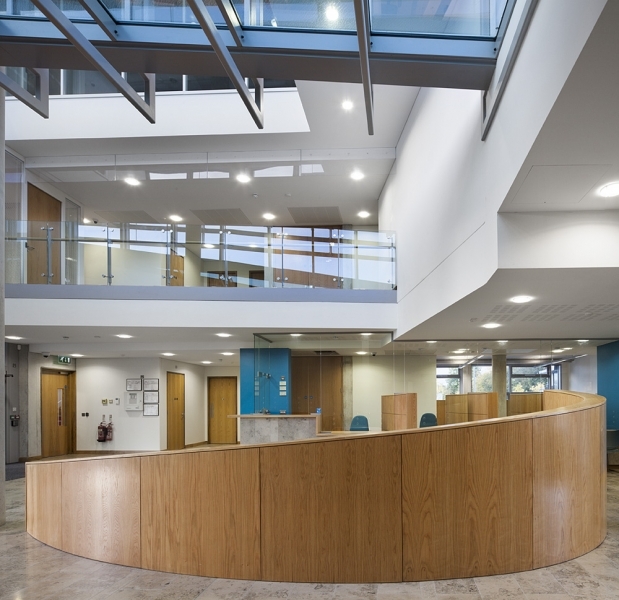 Project Description: Design & Build contract won in a Government D&B Competition for decentralised government offices in Tipperary, a Design / Build competition promoted by the OPW, to procure new offices for the Department of Justice, Equality and Law Reform and Tipperary Town Council. 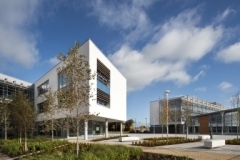 2 separate blocks, 2 and 3 Storey Office Block specially designed to the very highest level of sustainability. Total area with 2 blocks – 7,400m2; Government Offices – 4,900m2; Town Council – 2,500m2. Each building is entered into a full height atrium to provide ease of movement and orientation. 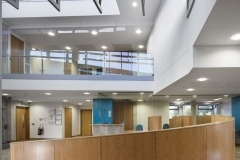 Office spaces are relatively narrow to ensure a comfortable, natural lit and ventilated work environment. The structure is highly insulated with ceiling soffits exposed to provide high thermal mass to moderate the internal conditions. Vertical air shafts are provided in both buildings to allow future provision of assisted ventilation to future proof against climate change. 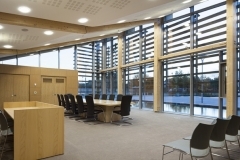 Most offices spaces have east and west aspects with solar louvre protection provided to south elevations. The offices are designed as public buildings in a new public space anchored by existing mature beech trees and enclosed by stone walls, which share a palette of form, scale, fenestration and materials. They are clearly seen to enclose separate functions with the council chamber clearly expressed to give prominence to the seat of local government. The new civic space extends across the public road to strengthen pedestrian links to the town centre. The landscape is designed to create semi private garden spaces to the offices and utilise landscape features and ponds to control storm water, and improve biodiversity. Car-parking is located to the rear of both buildings in landscaped secure area, enclosed by rebuilt stone walls. The energy demands of the buildings have a BER of B1/A3.